I have 4 years' of experience as Mathematics personal tutor in State, CBSE and ICSE board. I am research fellow of PhD - Statistics in School Of Sciences, Gujarat University. I have two years experience as a lecturer of statistics in K.K. Shah Maninagar Science College, Gujarat University. And lecturer of Operations Research in School Of Law, Gujarat University. "My young brother studied with him and he taught the concepts very well. Parth is very punctual about time and syllabus completion as well. " I have completed my BSc microbiology so which subject can I teach? You can teach chemistry and biology to school students. What would be the fees for class 10th student, for Maths, Physics , Chemistry and Biology for 3 days in a week? Parth P. Variya describes himself as Tutor. He conducts classes in Class 10 Tuition, Class 11 Tuition and Class 12 Tuition. Parth is located in Ghodasar, Ahmedabad. Parth takes at students Home and Regular Classes- at his Home. He has 3 years of teaching experience . 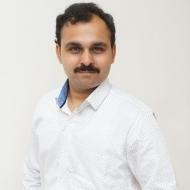 Parth is pursuing Doctor of Philosophy (Ph.D.) from School of Sciences, Gujarat University. He is well versed in English, Hindi and Gujarati. Parth has got 1 reviews till now with 100% positive feedback.